The stone out of luck article resonates. I may have a new one: iTunes truncates—with no seeming reason or rhyme—the last 15 seconds of tracks and jumps to the next track. I don’t have crossfade on and it seems more prevalent on ripped CD tracks I own. I have not subscribed to iTunes Match. You have now determined that the problem isn’t with the track but rather with iTunes. This saves you the trouble of re-ripping the thing. Just to be double-sure-plus, return to iTunes, select that track, press Command-I, and in the Options tab be sure that the Stop Time option is not enabled. 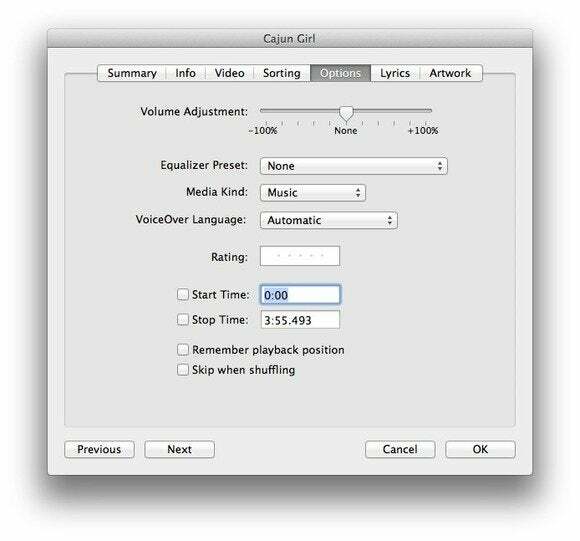 (For those not in the know, you have the ability to shorten track playback by adjusting a track’s start and stop times in this tab.) It’s highly likely that this option is set exactly as it should be, but we have to make sure. Be sure the Stop Time option is disabled. The next step is to delete the track from iTunes, but not from your Mac. You’ll first be asked if you’re sure that you want to delete it. Confirm that you want to do this. You’ll next be asked if you’d like to delete it from your Mac. This is something you don’t want to do as you’ve already proven that the track is perfectly fine, so click Keep File. Now return to where the track is stored on your Mac and re-add it. With a modicum of luck it will play as it should, from beginning to end. No? Let’s take the next step to get an idea of where the problem lies. Quit iTunes and, while holding down the Option key, launch it again. A Choose iTunes Library window will appear that contains Quit, Create Library, and Choose Library buttons. Click on Create Library and save your new library to your Music folder. Want to prove that your old iTunes Library is corrupt? Create a new one. Now navigate to one of these problem files and drag it into iTunes to add it. Press Play and see if it plays to the end. If so, your problem is with the iTunes database in your previous library. At this point you can attempt to recreate that database, as outlined by Apple. The gist is that you quit iTunes, navigate to the iTunes folder (youruserfolder/Music/iTunes), drag the iTunes Library.itl file to the trash and move the iTunes Library.xml file to the desktop. Now launch iTunes, where you’ll find an empty library. Choose File > Library > Import Playlist, navigate to the iTunes Library.xml file on the desktop, and click Choose. This should reload your library, complete with playlists, song ratings, and play counts. If you’ve done all this and the tracks are still truncated, it’s worth your while to make copies of these tracks and place them in the Public folder within the Users folder. Then create a new user account in System Preferences > Users & Groups and switch to that account. Launch iTunes, agree to whatever it is that iTunes demands you agree to, and import those tracks. They should play from beginning to end. And if they don’t, by gum, you are stone out of luck.